What would you have created with these four ingredients: Duck, Tomato, Wasabi and Cream? That's what Paper Chef, one of the longest running Food Blogger challenges around, is all about. Each month there is another set of random ingredients just waiting for imagination and execution to meet on a plate. One of my other spinning plates (aka: jobs) is teaching Improvisational Theatre. It's an art-form that, among other things, uses audience suggestions to create a story or character. I've been teaching and loving it for years. The challenge of creating something out of random ideas, being resourceful, developing and designing are all areas that get my spirit tingling. Like cooking, there are techniques that make the creations work better; the most talented make it look effortless. Like cooking, not every time out is successful, but it feels/tastes/sings/sparks when it really works and at least teaches you something when it fails. I am truly excited by this dish. 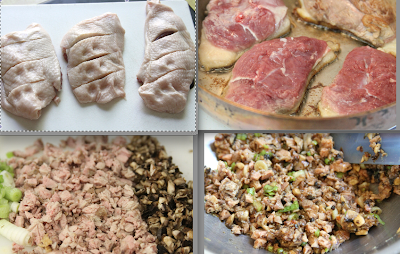 Duck is not always an inexpensive item, but with this recipe you can use just a couple breast pieces and make it go a long way, yet still enjoy the earthy taste and the elegant opportunity. If you have never made Pot Stickers before, this is a really easy way to give it a try. The first time I made them (with minced shrimp a few months ago) I think I made about 20 and feared they would go to waste. My son and husband ate 16 by themselves (I got 4). In a restaurant we would maybe split an order with friends and each of us have 1 - 2, but those guys made a meal of them. Like most things, home-made can't be beat. Turn the duck breasts over and sear the other side for about 2 minutes. Turn back so the fatty side is down and place the pan in the oven for about 10". Remove the duck to rest and cool. Remove the skin and chop the meat. In a bowl, add the meat and all the other ingredients, mixing well. Use about a teaspoon of filling in each wrapper. In a skillet, heat several Tbls of oil on Med/High and add the pot stickers (fold side up). Cook til the bottoms of the pot stickers are browned. Remove skillet from the heat and carefully pour in 2 cups of Tomato Broth. Return skillet to heat, cover and lower heat to steam the pot stickers for 5 minutes. 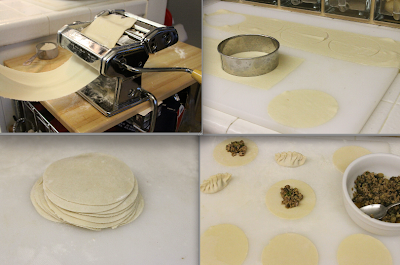 Remove cover, and using tongs, remove the pot stickers to a serving platter. Add more broth if needed to make a soupy sauce and stir. When ready, gently ladle the broth onto the platter to surround the pot stickers. Drizzle the Wasabi Cream as preferred. Serve to the delight of your peeps. Puree ingredients in a blender til smooth, and heat. Paper Chef is open to anyone - no sign ups, or commitments, just a spirit of self-challenge. Hope to see you there next month. what a fantastic recipe! i just visited a restaurant called Gyoza King in Vancouver and have been craving gyoza ever since. Can't wait to try this! What a wonderful recipe (love Rachael's blog, too) and a really lovely presentation. Great! inspiration to try something I've never dared to do. Thanks. What a great idea - and the presentation is amazing! I'll have to read those directions for making gyoza wrappers, I'm intrigued by it.